Heat oven to 350°F. Spray 18 regular-size muffin cups with cooking spray. In large bowl, mix 1 1/2 cups of the granola, the flour, baking powder, baking soda and salt. In medium bowl, beat eggs, brown sugar, buttermilk, oil and vanilla with whisk until combined. Add egg mixture to dry ingredients; stir just until combined. Divide batter evenly among muffin cups, filling about two-thirds full. Sprinkle evenly with remaining 1/2 cup granola. Bake 13 to 15 minutes or until toothpick inserted in center comes out clean. Remove from pans to cooling racks. Serve warm. Substitute another kind of Cascadian Farm® organic granola, such as fruit and nut or maple brown sugar. Try your favorite flavor! 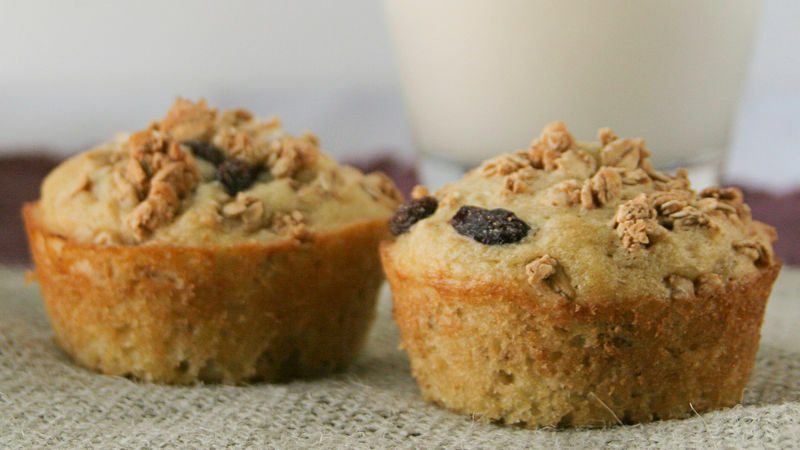 These muffins are best eaten the day they’re made. The next day, the granola will no longer be crunchy.